Tom's preview: A few years ago, semi-finals were a staple feature of life at Franklin's Gardens. Year after year, the club would rumble into the final four of one competition or another, with trophies expected rather than hoped for. But since things started to slide after then table-topping Saints lost to Saracens in the Premiership play-off semi-finals in 2015, the Gardens' only big knockout battles have come in the Champions Cup qualification play-offs. Saints were one step away from a final when they lost at Bath in last year's Anglo-Welsh Cup, but at that point, the competition was being used to paper over the cracks. It was the only hope of a trophy in a troubled season, and it eventually slipped away at the rain-soaked Rec, with Bath bagging a 13-12 success. 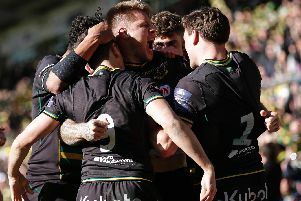 But a new lease of life was given to Saints when Chris Boyd arrived last summer, and the run to the semi-finals of this season's Premiership Rugby Cup feels significant. Not because the competition is the most glamorous or coveted on the calendar, but because of what it has shown about Saints. It has shown just how deep their pool of players now is thanks to the emergence of some really impressive youngsters. It has given those prodigious players a stage on which to shine - and they have used it well. Through the success of the Wanderers, they have built a winning mentality and taken that into the first-team. And if the likes of Lewis Ludlam, James Grayson and George Furbank, to name but a few, can now play a part in claiming a first-team trophy, it would do wonders for their belief. They already appear to have an inner steel that is allied with their ability, but building a trophy-winning habit is what it is all about. Saracens have showcased that, with their golden generation going from strength to strength with every single piece of silverware they have claimed. They have learned what to do in pressure situations, piling problems on opposition sides. And that is exactly what these young Saints will now hope they can do, starting in Saturday's semi-final against a tricky Newcastle team.